Please Read the article and checkout the screenshot below for reference ,The continuous controversies around the Tamil actor STR create a negative image . Now speculation suggests that a new set of controversy is flying around the star after the conversation of a popular Tamil Tv anchor is spreading on the Internet. Recently Actor STR participated as chief guest in the popular music reality show Super Singer telecasting on Vijay Tv. The show is scheduled to telecast on the Tv channel on Sunday.This controversy begins when the host of the reality show MA Ka Pa Anand shared the atrocities of STR with a co-passenger on a flight trip. When the unidentified co-passenger who is also a fan of MA Ka Pa Anand starts the conversation with him by asking why are you wearing coolers inside the flight. For that MA Ka Pa Anand replied that He didn’t sleep on last night because of STR’s bad behaviour in the show. He said that “The STR behave in a bad manner and tortured everyone on the show and also added he took 2 hours break for one hour show. Not only Me, every person even other celebrities on the shoot of the reality show got upset because of the unmannered behaviour of STR”. 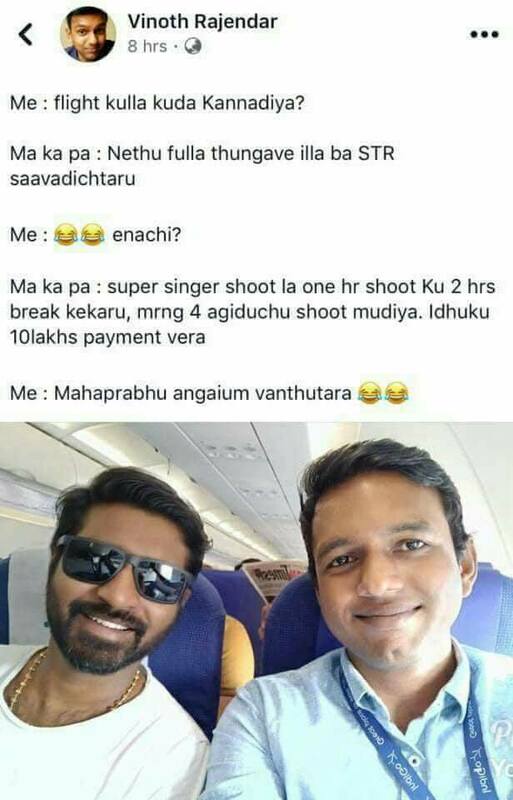 Ma Ka Pa also added STR got 10 Lakhs rupees payment for coming as a guest to the reality show. The unidentified co-passenger shared his conversation with MA Ka Pa Anand on his social media account which is spreading as viral on the internet. Even before the show is being telecasted on air the controversies started to fly around the sensational star. Reports suggest that the entire show is scripted and the only motive of the show is to increase the TRP of the channel and the market value of the actor.